For 15 mornings in a row, I've woken up at 6 am, pulled a prompt from a hat and created a painting. It was a crazy idea that popped into my head to celebrate the New Year (2018), doing an 18 Day Painting Challenge. Not only did I want to do something that would get me motivated and out of bed earlier, I also wanted something that would push my skills and potentially take me in new direction. Day's 15's prompt was "a single eye". 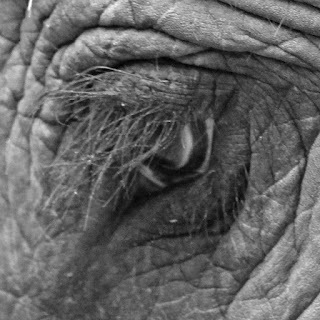 Heather and I had several close up photographs of the elephants that we befriended at the Elephant Haven near Kanchanaburi, Thailand. I picked one of the first ones that I took and created a piece that is quite unique, compared to its 14 predecessors in the challenge. This is a 12" x 12" original called "The eye of the damri (elephant)". Of the 15 paintings, six have been purchased by clients in Lethbridge, Edmonton, Mission (BC) and Fort McMurray. We are 68-percent of the way to being able to sponsor the construction of a house for a family in need. Heather and I will be returning to Cambodia in November/December with Bracelets 4 Buildings, as it was such a life-changing experience last time. 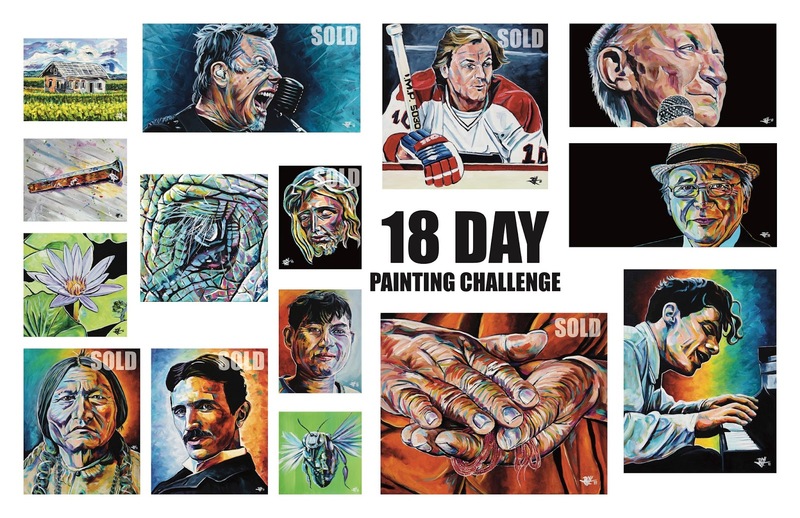 The unsold paintings at the end of the 18 Day Challenge (on Monday) will go into an online auction, along with a few other pieces. So, stay tuned for that information. We also sell canvas prints of a limited number of paintings, all net profits also support our charitable and humanitarian efforts. Thanks to hundreds of people who have purchased prints, we are able to support a group like the Fort McMurray Ukrainian Cultural Society. They approached me and asked if I could donated something to their silent auction at the Malanka celebration which is happening tonight at Shell Place. I happily agreed to provide a 16" x 24" canvas print of "Resilience and Courage - a portrait of Gord Downie". They then wanted to thank me by offering free tickets to the event. However, I prefer to have roles at these kind of things, and have offered to do an additional live painting as part of the celebration. The painting that I create at the event will be auctioned off to support the group and all the great work they do in our community. As I look at the calendar, I have a series of workshops coming up supporting St. Anne School, the Father Mercredi Jazz Band, Canadian Mental Health Association, and Mark Amy Treatment Centre. I am able to donate my time to these events because so many of you have purchased prints of your favourite paintings. I really can't thank you enough. 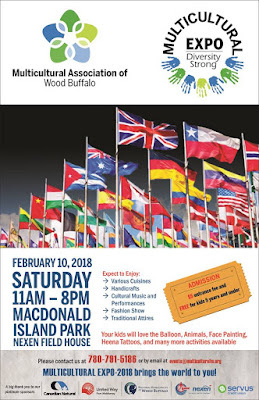 One other note, I'll be doing a live painting at the upcoming Multi-Cultural Expo on February 10th. 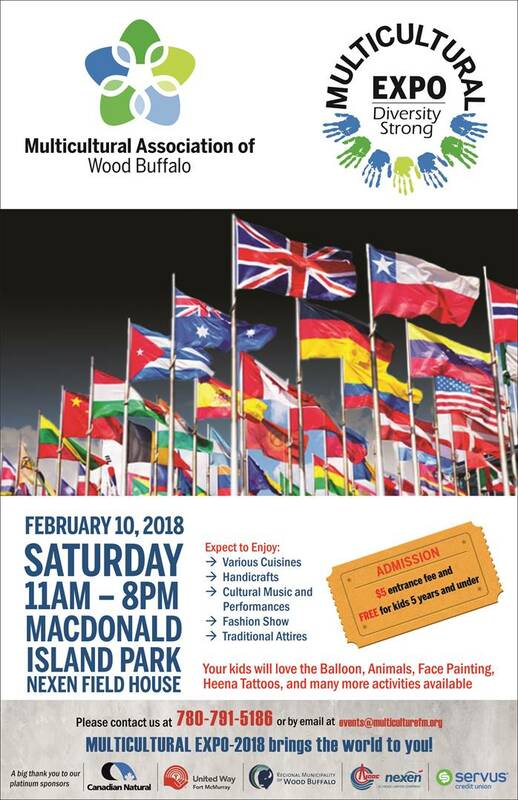 The amazing ladies at the Multicultural Association of Wood Buffalo reached out and asked if I would like to buy a booth at their event. I'm going to do a number of paintings inspired by diversity and inclusion. We will also have a few things for sale at the event, including two sets of greeting cards that are currently being prints, one featuring my exotic animal paintings, the other featuring some of my more popular paintings of musicians.